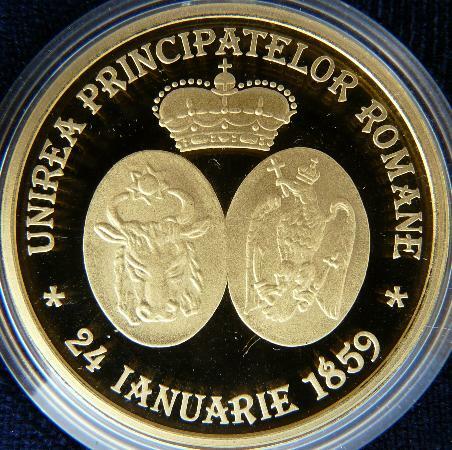 Obverse: ROMANIA, coat of arms of Romania, face value "500 LEI", year 2009, bust and name of the prince ALEXANDRU IOAN CUZA Reverse: coat of arms of Moldavia and Walachia inside oval shields, under a princely crown, inscription UNIREA PRINCIPATELOR ROMANE * 24 IANUARIE 1859 * meaning "UNION OF ROMANIAN PRINCIPALITIES 24 JANUARY 1859"
The effigy of prince Cuza appears on the 50 lei 1991 - 1996 circulation coins and on some anniversary coins: 500 lei from 2004, dedicated to the 140th anniversary of the Bucharest University, 500 lei gold 2009, dedicated to the 150th anniversary of the Union between Moldavia and Walachia in 1859, 10 lei 2009, dedicated to the 150th anniversary of the Statistical Office and on the coin set of 1 leu, 5 lei and 100 lei 2009 dedicated to the 150th anniversary of the establishment of the General Staff of the Romanian Army. 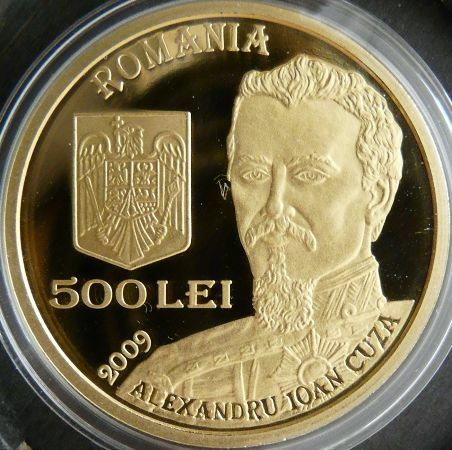 The 500 lei 2009 coin pictures above are present on the site through the permission of Mr. Laurenţiu Ionescu. These pictures, like all other pictures displayed on Romanian coins / Monede româneşti, cannot be used in any circumstances to illustrate auctions or sales and cannot be posted on other web page without the permission of the owner.